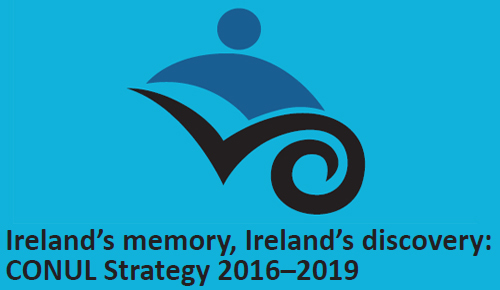 It gives me great pleasure to introduce Ireland’s Memory, Ireland’s Discovery, the CONUL strategy for Ireland’s major research libraries 2016-19. In developing this strategy the directors of CONUL libraries had three overarching objectives: to ensure CONUL is meaningful to the stakeholders we serve and to our members; to engage library staff in our member institutions; and to enable CONUL to act as the voice of research libraries on the island of Ireland. In pursuit of these objectives Ireland’s Memory, Ireland’s Discovery articulates goals and actions for consolidating, developing, and promoting CONUL collections as important learning, research and cultural assets, supporting excellence in practice and informing and influencing policy. Following consultation with attendees at the inaugural CONUL conference in June 2015 the CONUL Strategy Group was formed. The Strategy Group brought the strategy to fruition and is now charged with implementing it. On behalf of the CONUL Board I wish to formally acknowledge and thank the members of the Strategy Group for the commitment and contribution they have made to CONUL and its future direction. I wish also to thank my fellow board members for their generous support and guidance throughout the strategy development. CONUL’s values of collaboration, innovation, open access, and excellence underpin our strategy. As CONUL enters a truly exciting phase of development I sincerely believe that it is these values and the energy and enthusiasm of CONUL staff which will ensure the successful delivery of this strategy.